We are experts in setting up registration processes and have used our 25 years experience of event management to create an online registration system that is totally flexible. Taking care of all your event registration requirements, Eazybook is the most intuitive tool on the market. Eazybook integrates into any website. There is no software to install and no programming required. Once we issue you with a password and simple to use instructions you are ready to go. It’s that eazy! Eazybook has been designed with simplicity in mind, our usable web interface ensures that your customers experience a quick and simple registration process, and can take control of their own registration requirements. To register, users simply log onto the Eazybook website or they can click through to the registration pages from your own website. Users then set their own password so that they can re-visit their registration as often as they need. This means you can invite your users to submit their abstract, register early (early bird discount), invite them back to book accommodation or choose sessions from the programme nearer the event. 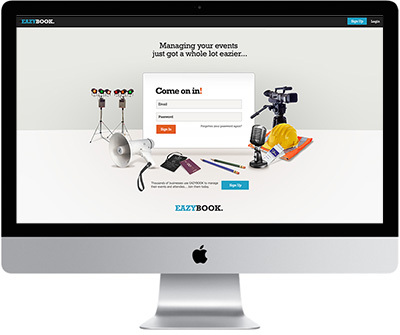 Eazybook is designed by event managers, for event managers. All aspects of your event can be set up and managed via our simple online interface. We will furnish you with eazy to use instructions, and helpline support to ensure you use Eazybook to its full potential.